NOTE:To get a ‘better’ Bluetooth experience on BLE 4.1 modules, we highly recommand you to update the newest firmware first. AT is the abbreviation of attention. AT command is the communication command used to configure Bluetooth parameters. It begins with AT, end with (carriage return and line feed). NOTE: is not a part of AT Command. 1. 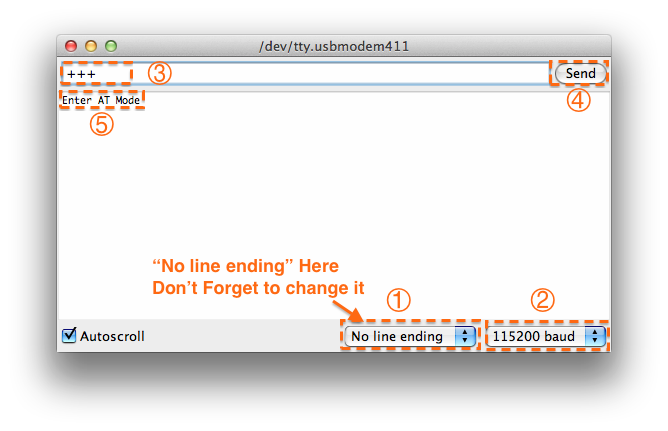 Open the Arduino IDE. 6. If the AT Command Mode is successfully access , you will receive "Enter AT Mode"(⑤) from it. 9. If the BLE is successfully configured , you will receive "OK"(⑤) from it. 10. If received "ERROR CMD" instead, try sending it again or you should check whether the command is correct or not. Before using BLE4.1 series devices, it is better to know some key buttons first. BOOT: Update Bluetooth firmware/Enable the approach connection (<10cm). Approach connection**: Press and hold the host BOOT button, approach the slave Bluetooth device to connect. Different from the traditional Bluetooth (such as Bluetooth headset), BLE4.1 need specified eigenvalue and device service ID to connect smartphone. The direct connection between BLE and smartphone device manager will lead to communication problems. Therefore, it needs a the third party APP, such as BunoBasicDemo (published by DFRobot), BLE Device Monitor from TI .etc. In this section, we'll take BunoBasicDemo published by DFRobot as an example. Set BLE4.1 as peripheral device with command AT ROLE=ROLE_PERIPHERAL. Set connection mode as P2P by AT NETWORK=P2P command and restart BLE4.1 (power off and restart). Open BunoBasicDemo app, click SCAN, then we'll see the scanned BLE4.1 device . Click the device to connect. Once it connected successfully, it will show Connected and LINK will light for 3s and blink for every 3s. 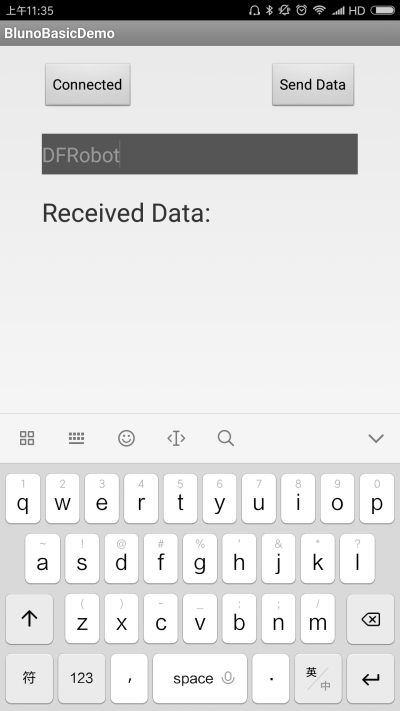 Click Send Data to send data. The procedure of BLE4.1 P2P connection is similar to BLE4.0, and the only difference is the P2P mode command. There are two devices in all, one should be set as the master device(ROLE_CENTRAL) and the other one should be set as the slave device(ROLE_PERIPHERAL). Config two BLE4.1 devices as P2P connection mode with AT NETWORK=P2P (Default: P2P mode). 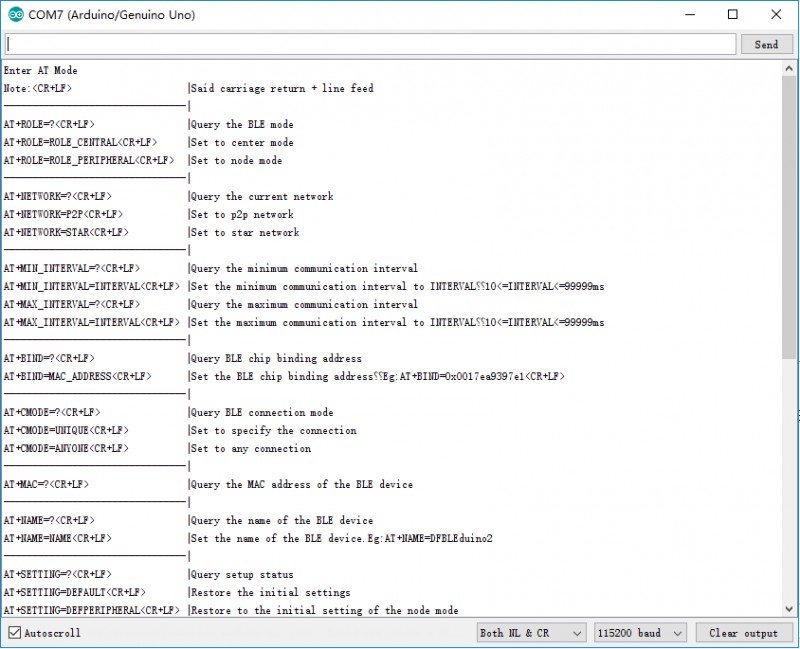 Restart BLE4.1 device and begin the approach connection. The first time you press and hold the host BOOT button is only for add the new devices to the white list. It doesn't need the same operation for the second connection. 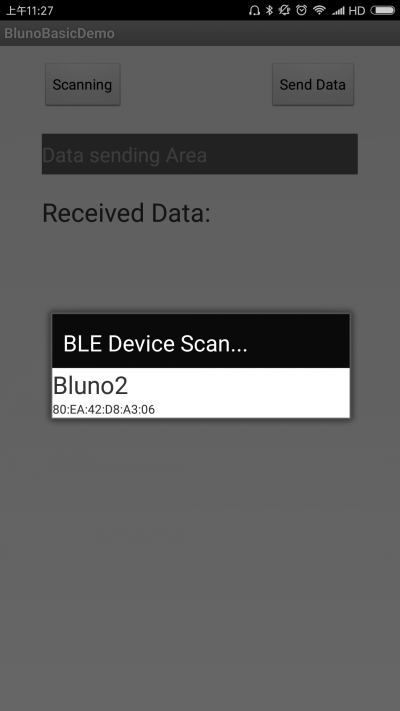 BLE 4.1 device is also compatible with BLE4.0 devices (Bluno 1st generation). And BLE 4.0 only supports P2P connection, so it doesn't need to set the connection mode for 4.0, just BLE 4.1 only. The star network connection mode is similar to the P2P connection mode, the difference between them in setting is that the star network uses the command AT NETWORK=STAR. The light LINK suggests the node device has been added to the white list of the central device and then it will connect the listed device automatically. 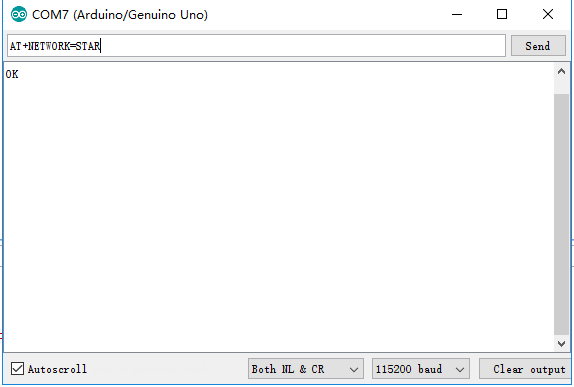 NOTE:Star network connection is only for BLE4.1 device, not applicable to Bluno 1st generation (BLE4.0) and other BLE brands device. 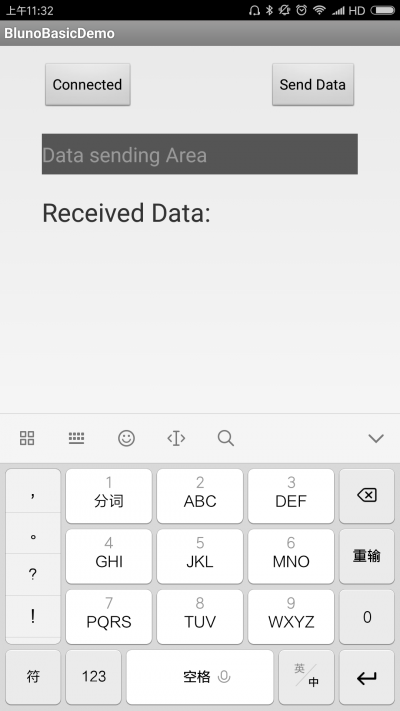 In the star connection, Bluetooth device adopt special data packet compression method. You can use Arduino library to realize network data transmit. Click the link to download Arduino library files and Arduinojson library files. During the connection, the slave device which first connected to the host will get ID: 1 and hereby superimposed. The sample code shows how to get network ID of the device and ID of the data source. You’d better to power the device in turn when build star network. Bluno 2 wireless programming is completely compatible with Bluno1 (BLE4.0). And it is only available under P2P connection mode: the host (the central device) to the slave side. Similar to P2P connection, set one as host and plug to the PC; set the other one as slave. Pairing the host and the slave, download is available. 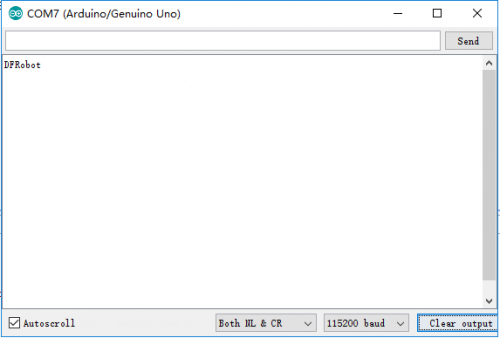 Connect BLE4.1 to PC and loose BOOT, CHG and LINK flashes alternatively. 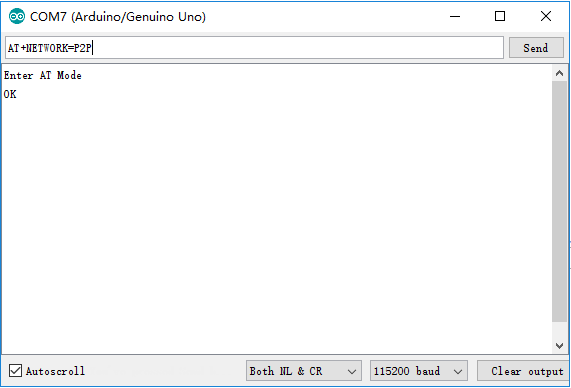 Open Bluno2 Firmware and select corresponding serial number. Q How to deal with the situation cannot download? Check basics, such as power supply, board type and COM port. 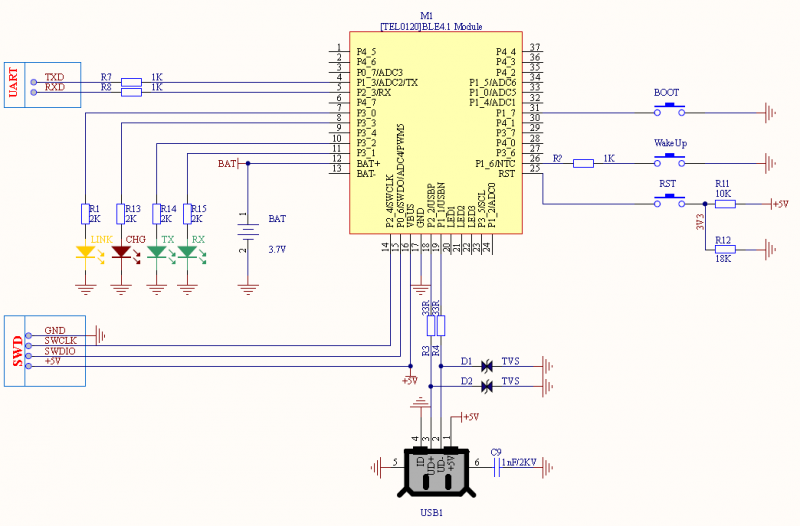 Bluetooth will occupy the serial port which will hamper uploading. Please disconnect the current Bluetooth connection, and try again. The device serial port may be occupied. Please disconnect all peripherals then recompile and download again. Arduino IDE may crashed. Please disconnect all Bluetooth (include smartphone), close all Arduino IDE software, pull USB line, reopen and test. Bootloader in the FireBeetle 328P may get lost. Please try re-uploading Bootloader of ATmaga328p.